1953　Ichiro Nomura was born in Okayama. 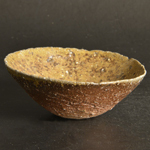 1981　Started ceramic study in Bizen. 1991　His first firing (“Hatsugama”) was held in Nishisho, Okayama. 2007　Ｈad another first firing held in Ohgashimaji, Okayama.